Written entirely in Hebrew and decorated with illuminations, Haggadah Illuminated retells the story of the Israelites and their famous exodus from slavery in Egypt. The Haggadah is a sharing of history, culture, and religion, and author Even Caredio honors this tradition with the sacredness and splendor of Haggadah Illuminated. For those who want to keep tradition, the “telling” is done in Hebrew. Halloween has evolved from the Druids’ celebrations of 2,000 years ago to become today the fastest-growing holiday in the country. This, the only book to completely cover All Hallow’s Eve, examines those ancient origins as well as its traditions and celebrations, from costuming to bobbing for apples. Jack-o-lanterns, black cats, and witches are explained. Ghosts, ghouls, and goblins lurk behind every page. Paperback. Halloween has evolved from the Druids’ celebrations of 2,000 years ago to become today the fastest-growing holiday in the country. This, the only book to completely cover All Hallow’s Eve, examines those ancient origins as well as its traditions and celebrations, from costuming to bobbing for apples. Jack-o-lanterns, black cats, and witches are explained. Ghosts, ghouls, and goblins lurk behind every page. A is for apple, B is for bat, and C is for cat in this beautifully illustrated ABC book that celebrates the traditions of the year’s spookiest holiday. Each letter of the alphabet represents another aspect of Halloween lore, so readers learn that jack-o’-lanterns have their origins in an old Irish myth and the harvest festival Nutcrack Night was a precursor to Halloween. Paperback. If you’re looking for information and instructions about every aspect of Halloween, you've come to the right place. A Halloween How-To is packed with ideas for October 31. There are fifty great costumes you can make yourself, recipes for everything from fake blood to pumpkin soup, and lists of great movies, CDs, and spooky books. Paperback. Halloween Merrymaking: An Illustrated Celebration of Fun, Food, and Frolics from Halloweens Past offers a fascinating glimpse at material from a vast assortment of the vintage party guides and larger-than-the-size magazines that guided intrepid hostesses in their quests to stage parties worthy of the holiday’s reputation for mystery and fun. Filled with illustrations of vintage photographs and mementos, this book pays splendid tribute to the imaginative festivities of yesteryear. Hardcover. It took two years of investigative work for Halloween authority Lesley Pratt Bannatyne to add a fifth book to her collection. Traveling across the country, she visited and talked with fanatics and fang makers, professional haunters, registered mediums, psychologists, and Halloween enthusiasts ranging from NPR’s Garrison Keillor to Incubus guitarist Mike Einziger and The Simpsons’ “Treehouse of Horror” writer Mike Reiss to find out what the increasingly popular holiday means to people and how they celebrate it. Wondering how to entertain guests at your Halloween party this year? Why not recite a poem, tell a story, or present a parlor drama? A Halloween Reader is sure to add excitement to the celebration. Paperback. Halloween has not always been the occasion for confections, costumes, and cunning tricks that it is today. Halloween: Romantic Art and Customs of Yesteryear is a colorful and exciting celebration of Halloween past. The book artfully blends narrative and old-fashioned poems, prose, and chants with eye-catching images of vintage ephemera and fanciful illustrations. Hardcover. Halloween has not always been the occasion for confections, costumes, and cunning tricks that it is today. 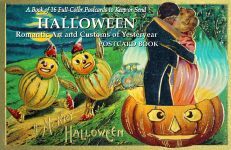 Halloween: Romantic Art and Customs of Yesteryear Postcard Book is a colorful and exciting celebration of Halloween past. The postcard book artfully blends narrative and old-fashioned images of vintage ephemera and fanciful illustrations. Postcards. As the children drift off to sleep, visions of what Santa might bring fill their dreams. While Mama and Papa watch as Santa, known as Kanakaloka, comes drifting in with his net full of toys. He surfs to the island on his outrigger canoe led by his majestic sea turtles. Beginning in 1812, this fictional biography follows the life of Henriette Delille, a free woman of color who founded the Sisters of the Holy Family. This examination recounts her spiritual journey and struggle to break free from French Quarter society, despite her family’s protests. Instead, she chose to focus on the needs of the less fortunate, teaching such principles as chastity and obedience, until her death in 1862. Casimir Pulaski was a Polish patriot who came to America to help the colonists win the American Revolution. An expert horseman from childhood, Pulaski gained battle experience trying to defend his homeland against the Russians. When both his father and brother were lost to the war, Pulaski left Poland looking for assistance in raising another army. This collection of one novella and three short stories captures the traditional, emotional spirit of Christmas and presents the spirit in contemporary settings. With this comprehensive book, author Robert Lewis Berman shares the story of a Jewish society located in Lexington, which is tucked away in the heart of the Mississippi Bible belt. He provides an extensive history of the town, profiles the families who made it flourish, and records his own personal experiences. Personal photographs and interviews make this book an intimate memoir of an almost unknown Mississippi town. Hardcover. Told through repetition and rhythm, this Halloween tale invites children to participate in the fun. Cats meow, skeletons rattle, bats flap, and a mom fusses at a picky little boy—all in Witchy’s creaky old house. Throughout the story, other spooky creatures come out to play! Finely detailed cut-paper and collage illustrations complete this frightful fable.